Copyright 2008 Taylor & Francis. 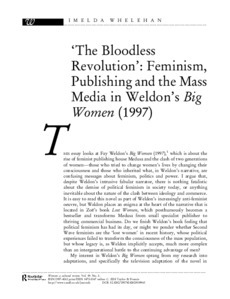 This essay looks at Fay Weldon's Big Women, which is about the rise of feminist publishing house Medusa and the clash of two generations of women - those who tried to change women's lives by changing their consciousness and those who inherited what, in Weldon's narrative, are confusing messages about feminism, politics, and power. I argue that, despite Weldon’s intrusive fabular narrator, there is nothing fatalistic about the demise of political feminism in society today, or anything inevitable about the nature of the clash between ideology and commerce. It is easy to read this novel as part of Weldon's increasingly anti-feminist oeuvre, but Weldon places an enigma at the heart of the narrative that is located in Zoë's book Lost Women, which posthumously becomes a bestseller and transforms Medusa from small specialist publisher to thriving commercial business. Do we finish Weldon's book feeling that political feminism has had its day, or might we ponder whether Second Wave feminists are the 'lost women' in recent history, whose political experiences failed to transform the consciousness of the mass population, but whose legacy is, as Weldon implicitly accepts, much more complex than an intergenerational battle to the continuing advantage of men?